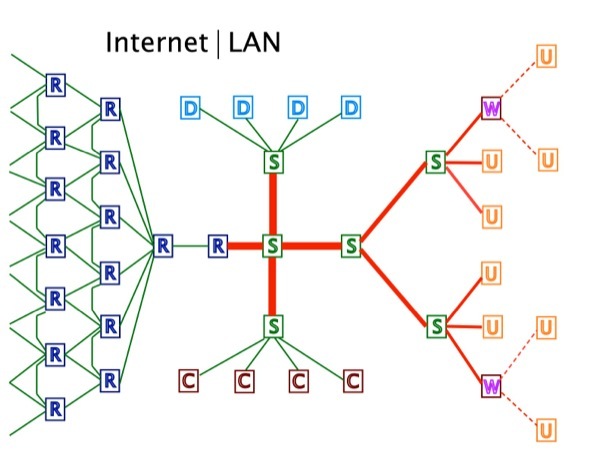 How Fiber Networks Work - It's Magic! In the June FOA Newsletter, we talked about the new #M "disposable" cleaver, the Easy Cleaver, which is provided free with 3M connectors and mechanical splices that need cleavers. We got samples of the Easy Cleaver from 3M and tested them ourselves, and they work great. 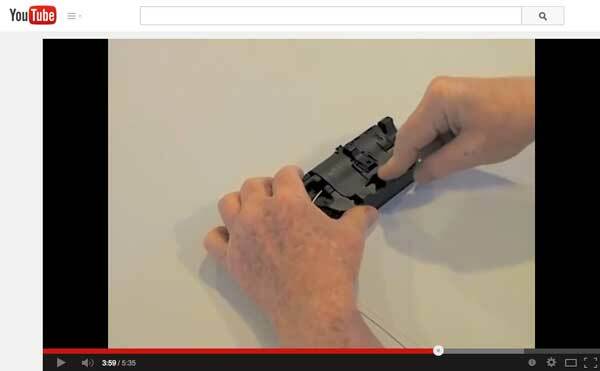 You can see for yourself how they work in this FOA YouTube Video about the Easy Cleaver. If you want to know more about the 3M easy Cleaver, you can find it here on the 3M website. Go here for more information on Ripley fiber strippers. We have plans for other product reviews - but what would you like to see? Join FOA on Pinterest. 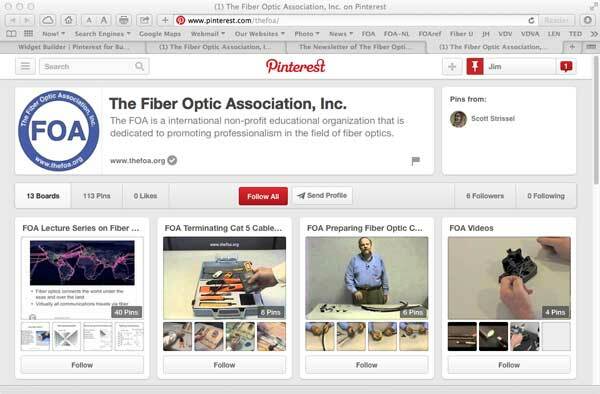 FOA has started a Pinterest page for fiber optics. 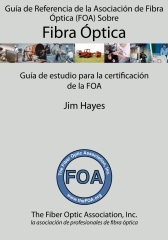 Last month, we talked about the new FOA Application Specialist Certifications on Fiber To The Antenna (FTTA) and Fiber Characterization which are applications certifications as opposed to skills certifcations like splicing, connectors and testing. This month, we are ready to announce another, Data Centers, that covers the types of cabling involved in data centers and how they are chosen, designed, installed and tested. This course covers small and large data centers and does not cover data center design which includes how to locate racks of servers and switches and how to power and coll them. We just focus on the cabling including tradeoffs in cabling for >10Gb/s. We are also working on a DAS (distributed antenna systems) course, as these systems are becoming more popular and often a challenge for installers. FOA was visited recently by the personnel from 100G, the FOA-Approved School in Singapore. 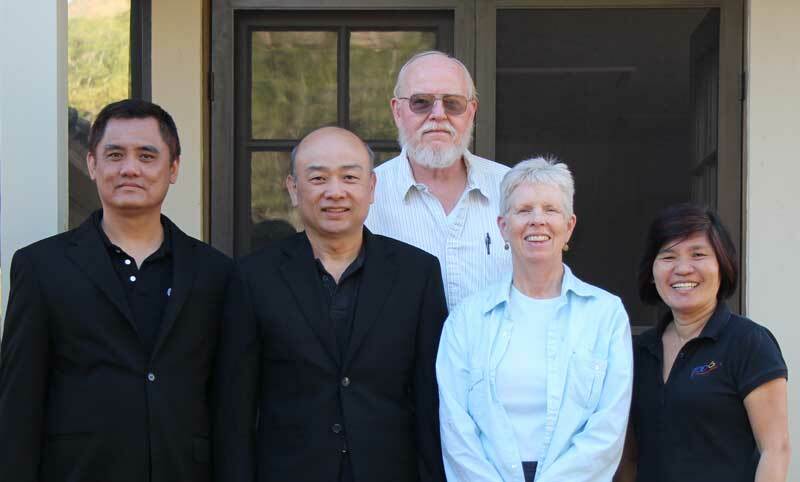 In the photo, on the right is Bee Suat Lim, next Karen and Jim Hayes, Isaac Yeo Hock Lai and KC. FOA and 100G had time to discuss 100G's work in Singapore and SE Asia as well as FOA programs for the region. We also generated some new ideas for FOA curriculum and technical material. Sporting events are now very high-tech events. The most visible technology are the large screen TVs that are scattered around playing fields and auto racing tracks to show the action close up and live. Feed for the broadcast TV crews is carried around the facility on fiber and out to distribution on fiber or direct to satellite. Often forgotten is all the fans using their smartphones over WiFi or cellular connections. Not just watching video or talk/texting to friends, but using the team apps to order food to be brought to their seat! At a recent game at the new San Francisco 49ers stadium, about 60% of the fans were on their smartphones using 1Gb/s of data bandwidth for over two hours - over 2.13 terabytes of data during the event. How can a stadium handle such traffic? Easy if you have 680 Wi-Fi access points and 12,000 Ethernet ports, all connected to a 40-gigabit-per-second fiber optic connection! The new $1.2 billion stadium in the heart of Silicon Valley is super high tech thanks to partnerships with Sony and now Yahoo. Read more, and more, and more. On the auto racetrack front, CommScope has become the first technology partner at Daytona International Speedway. CommScope will install an estimated 355 kilometres of Category 6 cable, 80 kilometres of single mode fiber optic cable and all terminations supporting digital signage and way-finding, upwards of 1500 HD displays, synchronized stadium-wide messaging, Wi-Fi connectivity in social areas, and an enhanced audio experience. Read more. In case you think cabling speedways with fiber is new, here is a photo from the Long Beach Grand Prix from almost a decade ago. And much earlier than that, over two decades ago, Road Atlanta did some of the first fiber at a racetrack, certainly influenced by the fact that track co-owner Jim Kanely was founder of one of the first independent fiber optic cable companies, Valtec! And on a related topic....what are these guys doing? 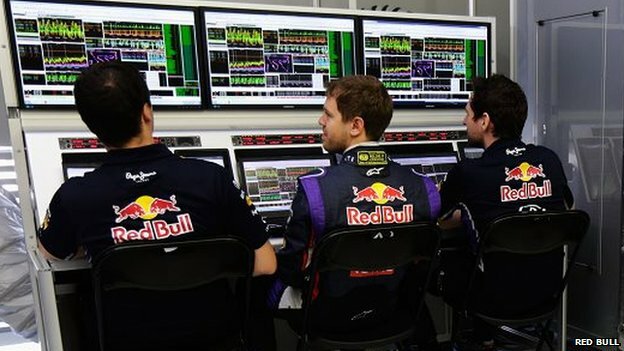 These are race engineers for the Red Bull Formula 1 team with 4-time world champion Sebastian Vettel in the middle. Formula 1 is the fastest and most technically advanced form of automobile racing - and the most expensive. Each F1 car has about 150 sensors that monitor everything going on with the car and as many as 60 technical personnel trackside to support the cars. But there may be another 150 or so engineers working at the same time back at the factory, analyzing data, running simulations and feeding back to the track information to make the car run faster. 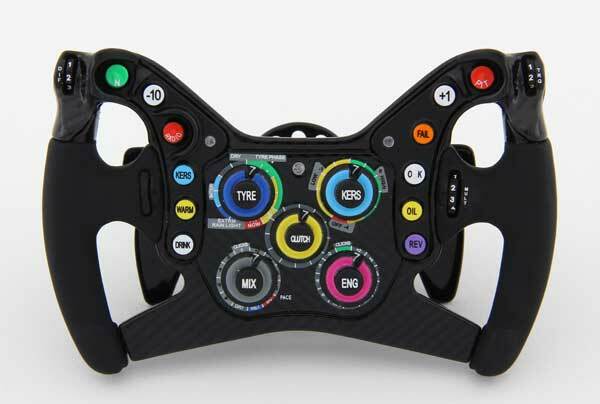 The driver has a steering wheel with a dozen or more controls to make adjustments to the car in real time. As you can imagine, all this data moving from race track to factory and back requires both a lot of bandwidth and - especially - low latency. The support required for every one of the 11 F1 teams is immense. 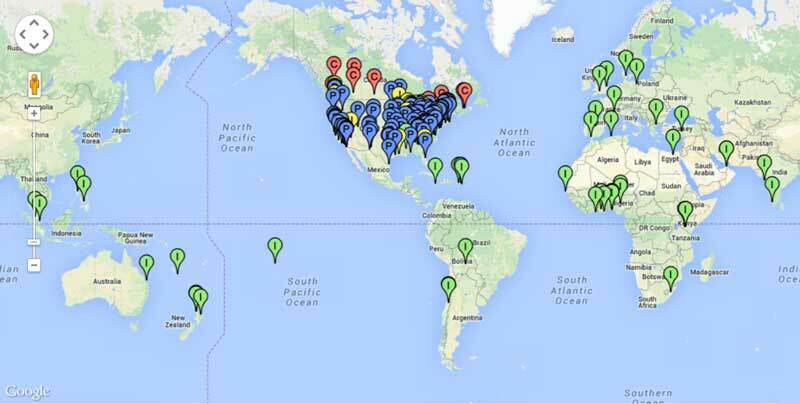 F1 races on 20 circuits around the globe: China, the US, Australia and Monaco are among the locations. At every location, the telecom support crew installs a temporary high-speed network for the team’s use. To do this, AT&T, which supplies the communication systems to Red Bull, deploys an army of engineers to each location, installing a connection that has a maximum latency of 300 milliseconds - the time it takes for a human eye to blink. When the races are held closer to Red Bull's factory, which is based in Milton Keynes in the UK, the delay can drop to a amazing seven milliseconds. The BBC recently posted a long story about how this all works - it's a good story. Read it here. Courtesy of FOA Member Robbie Grubbs. Download the full size version here. As we mentioned above, FO has been working on a number of new training courses - Fiber Characterization, Fiber to the Antenna (FTTA), and one just announced, Data Centers. 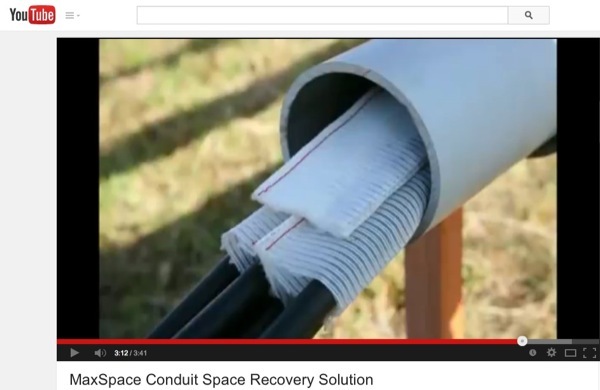 We're also working on a CI&M webinar on prefab cable assemblies for Sept 18. Each time we do something new, we find ourselves digging into new topics to fully understand the technologies we cover in these training courses. The FTTA and Data Center courses and the CI&M webinar include a lot on prefab (preterminated) cabling systems. 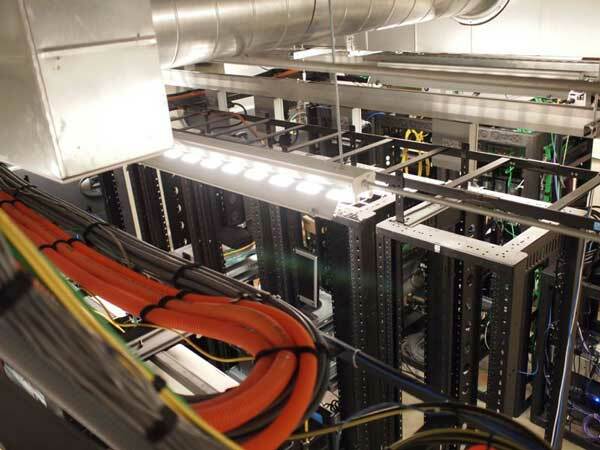 Some data centers also focus on parallel optics using MPO type connectors (but not all, or perhaps not many.) We wonder if there is a disconnect between what you hear in the trade press and advertisements and what is happening in data centers because we hear little about parallel optics using multimode fiber and lots about singlemode fiber using WDM. 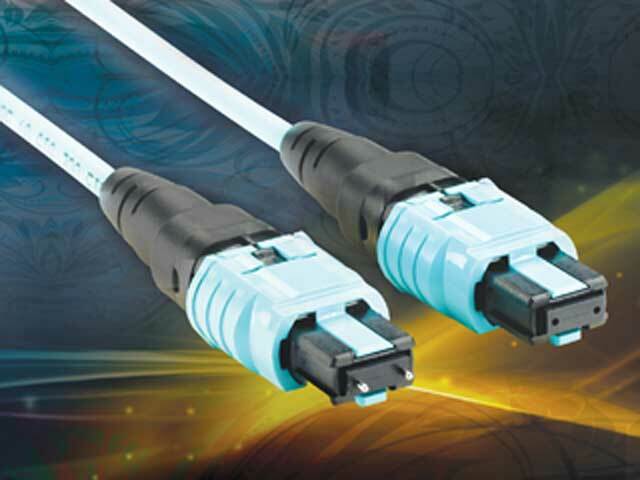 The biggest problem with parallel optics is probably the cabling complexity; a 100G port needs 20 fibers but ends up using 24 because the connectors are 12/24/36/48 fibers in rows of 12. 40G uses only 8 of the 12 fibers in a connector. Compare a parallel solution to SM CWDM (coarse wavelength division multiplexing) that uses 2 fibers per port. Sure the SM transceivers are more expensive, but the fiber is much, much cheaper - you only need less than 10% as many fibers for a 100G system, a massive savings in fibers per rack. The second problem is the connector itself. If you search the web, you will find discussions of the problems with polishing the large connector ferrule flat and higher loss in fibers away from the center of the ferrule (Belden app note.) But the biggest problem may well be the simplest one - polarity. The TIA 568 standard devotes approximately 21 pages to polarity options - even more would be included but another option from Corning was refused inclusion at the last TIA meeting. The problem with polarity is the connectors are fixed male (with pins) or female (without pins) and key-up or key-down. 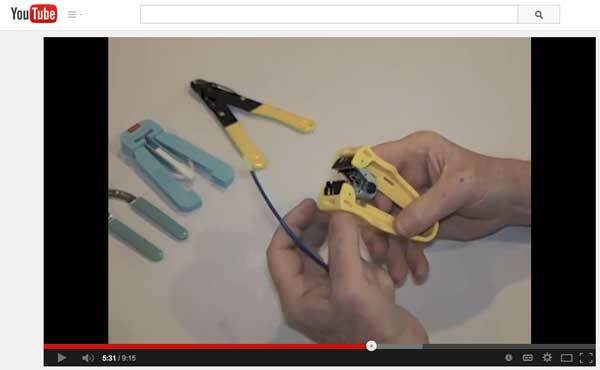 A single patchcord can have 16 different configurations! Somebody was not thinking straight when this connector was designed. But somebody came along and did think straight, but it was an FOA school instructor, Craig Bowden at FiberNexx in Concord, NY who told us about the "PanMPO," Panduit's MPO introduced last year that has options in one connector change one connector to make it male (with pins) or female (without pins) and key-up or key-down. With the PanMPO connector, you can remove the connector outer body and flip it to change to key-up or key-down. While the connector body is off, you can use a special tool to slide the pins back or forward to change the male (with pins) or female (without pins) gender. What a brilliant idea! 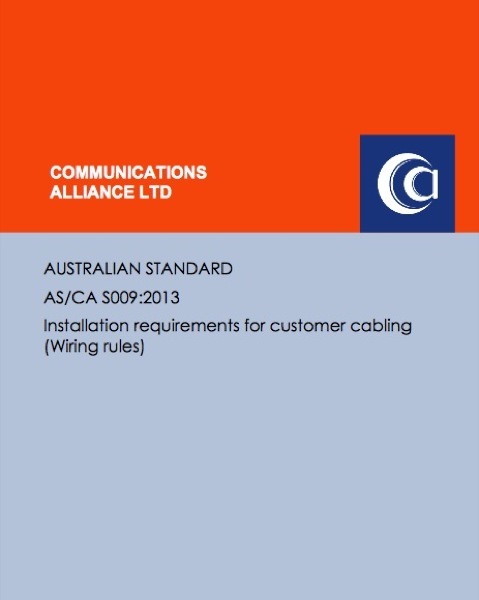 If they licensed this idea to all the other MPO manufacturers, we should be able to reduce the size of TIA 568 by about 21 pages and make the MPO a much more attractive option in cabling. 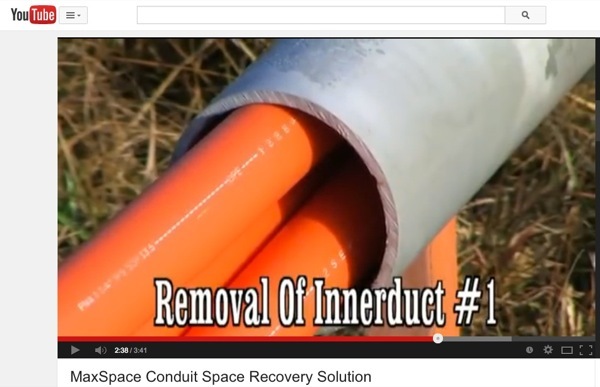 Be sure to watch the Panduit Video on the PanMPO on YouTube. Here is more data on the connector. Jon Brodkin, writing in ArsTechnica, is the author of this article which examines the pros and cons of fiber. The shift from copper landlines to fiber-based voice networks is continuing apace, and no one wants it to happen faster than Verizon. Still, Verizon campaigns against utility-style regulation that it benefits from. Internet users nationwide are clamoring for fiber, as well, hoping it can free them from slower DSL service or the dreaded cable companies. But not everyone wants fiber, because, when it comes to voice calls, the newer technology doesn’t have all the benefits of the old copper phone network. In particular, fiber doesn’t conduct electricity, where copper does. That means when your power goes out, copper landlines might keep working for days or weeks by drawing electricity over the lines, while a phone that relies on fiber will only last as long as its battery. Read the article on ArsTechnica. The Fiber to the Home (FTTH) Council Americas has released the results of a survey by RVA, LLC, revealing new data on the usage and impact of fiber to the home networks in North America. “After surveying broadband consumers for seven years, two trends are very clear. First, the importance of broadband to the consumer lifestyle increases with each passing year and second, end-to-end fiber optic networks are becoming more and more differentiated from other types of broadband in terms of performance, use, and perception,” said Michael Render, President of RVA, LLC. “The numbers in this survey represent what we hear from FTTH communities every day -- fiber is fast, reliable, and ready to meet their growing needs. But fiber is also letting people do more, from high-bandwidth health care applications to powering the many connected devices in a modern home. The impact of fiber is large and growing,” said Heather Burnett Gold, President of the FTTH Council. ● More people have fiber, and more providers are offering faster speeds: There are 10.4 million homes connected to fiber in North America compared with 9.7 million in May 2013 and there are now 58 providers offering gigabit-per-second packages. ● The need for faster broadband at home continues to grow: Users report now spending over 5 hours a day at home online and are aware of 5.5 Internet ready devices in the home. Broadband users under age 35 now report getting slightly over half of their video content from online sources. ● Satisfaction rates are far higher for FTTH than all other types of broadband: Consumers say higher satisfaction is based on both reliability and speed. 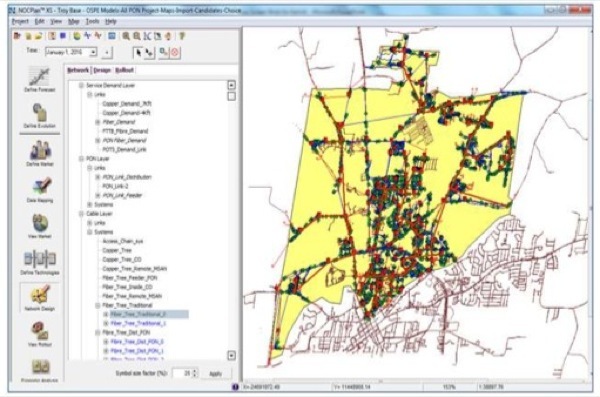 Based on speed testing during the survey, those with fiber optics all the way to the residence (fiber to the home or FTTH) enjoy far better performance. Comparing both ends of the spectrum in terms of performance, FTTH versus DSL, FTTH is now 5 times faster on download speeds and 23 times faster on upload speeds. ● Fiber optic Internet is changing lifestyles: Based on consumer estimates of the percent of time waiting for applications to load – “gears turning” – FTTH consumers are far more productive. Compared again with the slowest type of broadband, FTTH consumers spend 49 fewer annual hours waiting for things to load. 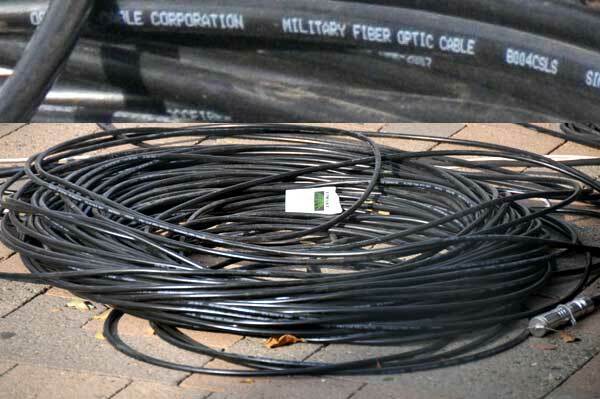 FTTH users work from home more often and enjoy a home value premium of over $5,000 versus other types of broadband. Many FOA instructors are also active installers like Milt Murry in St. Louis. 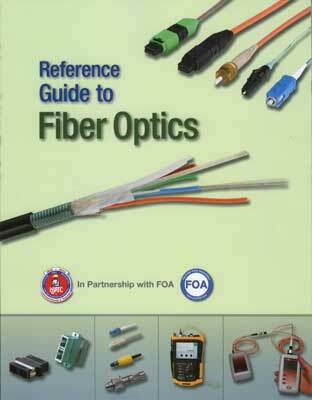 Often they send us stories about their work that helps illustrate the "do's and don'ts" of fiber optic installations. Milt recently did an install for upgrades at a 1934-era high school. Some of the teleco closets had automatic light switches. Very bad idea. It is not allowed in electrical rooms and some of the closet had panel boards. Just when you started to cleave the fibers for the prepolished connectors we were using, the lights would go out. Every telco room had 5 gallon paint cans stored in them plus cleaning supplies and dust mops, very dirty. The job was done during summer maintenance period and fumes from Gym floor restoration were overwhelming. The MDU was located just outside Gym on ground floor. Also cleaning and waxing was going on in other parts of building adding to the fumes. We could run this as a contest about violations of the US National Electrical Code or OSHA regulations, but we'll let you decide for yourself. The Aurora, IL Public Library has selected an Optical LAN solution for its new 92,000 square-foot main facility in Aurora, Ill., scheduled to open in May 2015. The Library will use Tellabs’ innovative GPON fiber-optic technology to meet its patrons’ growing bandwidth needs and build a scalable, simple, secure and sustainable local area network (LAN) infrastructure. “Tellabs’ Optical LAN technology is instrumental in the continued innovation of the Aurora Public Library system,” said Eva Luckinbill, director of the Aurora Public Library. “But, Optical LAN is not just a more innovative solution, it is an overall smarter choice. It gives us the flexibility to scale and adapt to whatever the educational and informational needs of the community are in the years ahead,” added Linda Whitmill, automated services coordinator of the Aurora Public Library. (Reuters) - Search engine Google Inc and five Asian telecom and communications companies have agreed to invest about $300 million to develop and operate a trans-Pacific cable network connecting the United States to Japan. To be named "FASTER," the cable network will have an initial capacity of 60 terabits per second and will connect Los Angeles, Portland, San Francisco, Oregon and Seattle to Chikura and Shima in Japan. NEC Corp, which will be the system supplier for the cable network, said in a statement that construction would begin immediately and the network would be ready for service in the second quarter of 2016. Read More. People have been asking FOA for more online training and some new specialized training programs, and we've been listening. We are ready to announce these new programs this month. More applications training is being developed and will be announced soon. Many of these applications-based courses require the same skills learned by CFOTs, so they may qualify for online certifications or certificates of completion. Watch this newsletter for announcements about more online courses. From the current version of TIA FOTP-8. 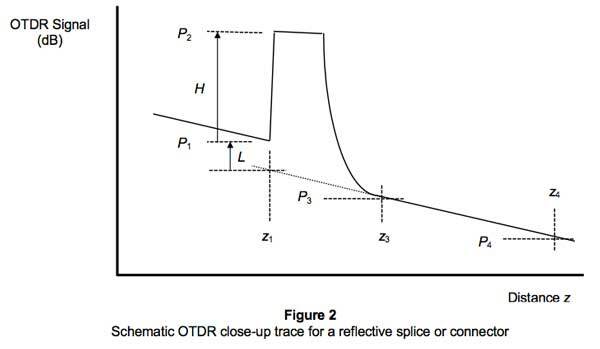 This is a figure from the TIA FOTP-8, Titled "Measurement of Splice or Connector Loss and Reflectance Using an OTDR." FOA co-founder and author of several books on fiber installation brought to our attention that the peak shown in this drawing appears to be highly saturated - that is the reflectance is so high that it overloads the OTDR receiver. 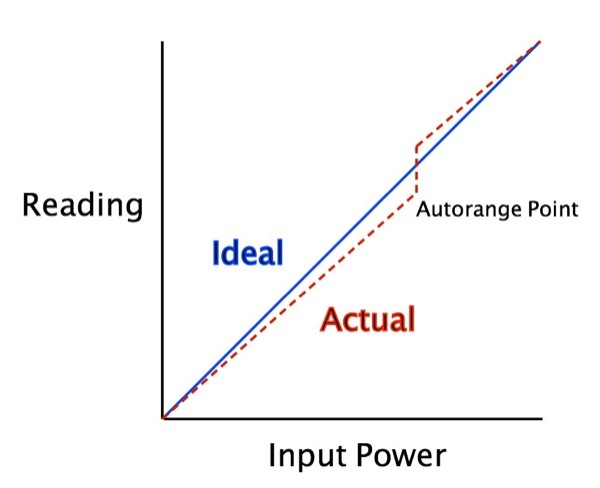 Under such circumstances, it is totally impossible to get a valid measurement of reflectance since you are not measuring the peak of the reflectance but the saturation level of the OTDR. 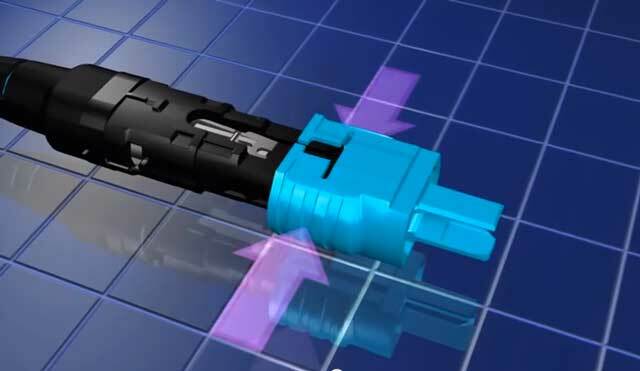 Eric points out the standard says "Ensure that the receiver is not saturating here; this may be done by attenuating the signal with an OTDR control, by an in-line variable attenuator, or by introducing a loop prior to the splice or connector." But the standard makes no reference to the figure indicating it is saturated and this peak shown cannot be measured accurately. The preceding figure purports to show a typical OTDR trace and events that can be identified, but the drawing itself appears to be a crude digital drawing from decades past that bears little resemblance to a real OTDR trace. 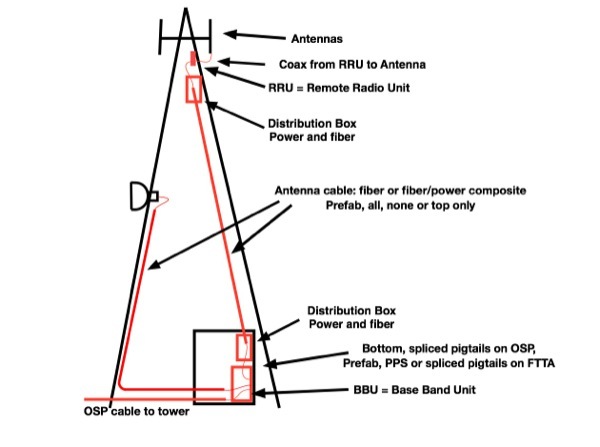 Proposed drawings from the proposed D revision of TIA-568.3-D are little better and one drawing shows a method of measurement that is unknown to several OTDR manufacturers I have contacted and no manufacturer has claimed they implement this method. Is this any way to write standards? Q: I have a 62.5 micron fiber and 50 micron connectors. We only need 62.5 capability. I have the tools to put the connector on the cable but will this cable work? A: There are several ways to interpret your question. 1) If you are talking about adhesive/polish connectors, the hole in the connector is the same for 50/125 and 62.5/125 micron fibers, so the connector itself is the same. 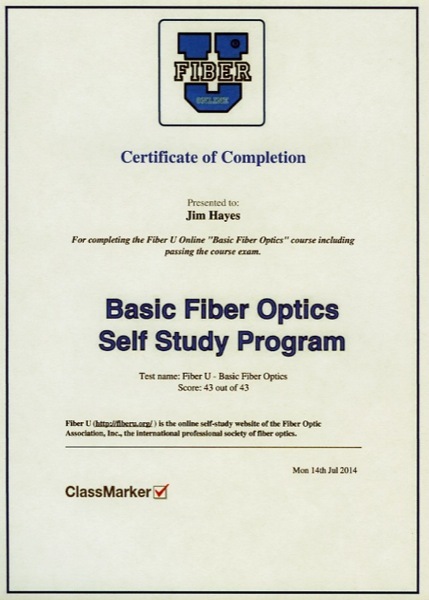 What Is The "Index Profile" Of An Optical Fiber? Q: In your textbook, you make mention of “Index Profile”(see pg 49). There are some other bits of information relating to that term. For multimode step-index, the profile appears square, for graded, rounded, and singlemode rectangular. I presume this is not the finish on the connector, but some other characteristic. I would appreciate if you could explain it to me. That's right, light travels in glass at about 2/3 the speed of light in a vacuum, interestingly enough about the same speed as electrons in UTP copper cable and much slower than electrons in coax which is ~0.9c. 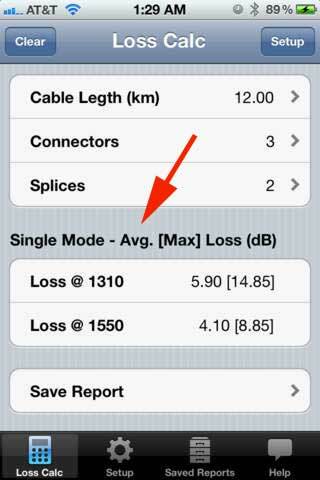 The choice of the index profile for fiber depends on the type of fiber and the transmission specifications desired. Step index fiber has the core made completely of one type of glass and the cladding of another type with a slightly lower index of refraction to "trap" light in the core using what we call "total internal reflection." 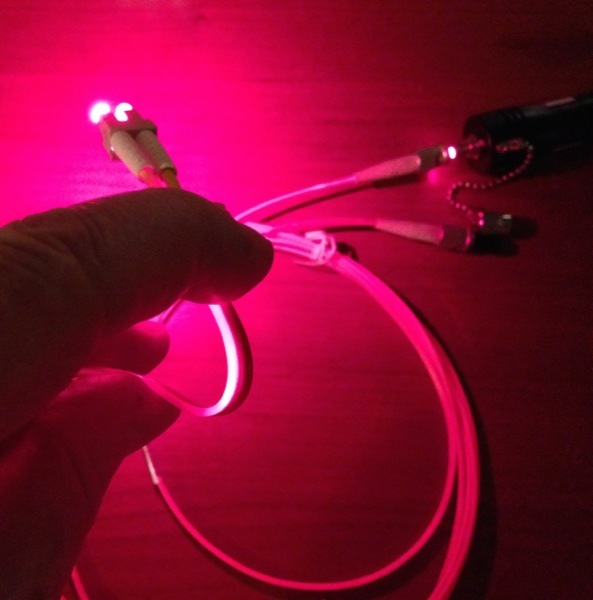 Singlemode fiber is a special step index fiber with the core so small that light cannot bounce around - the core is only ~6 times the wavelength of the light and it is only transmitted in one mode, allowing much higher bandwidth and lower loss. Graded index MM fiber is more complex. 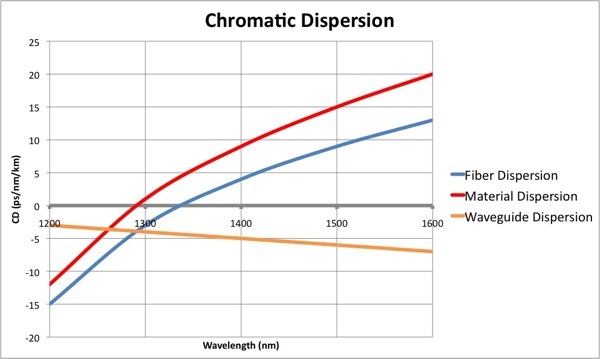 Graded index (GI) fiber has a range of materials in the core which are chosen to minimize modal dispersion caused by different path lengths of different modes being transmitted down the fiber. The core index profile is curved - a parabola to be exact - with lower index glass on the outside of the core. The lower index glass transmits the higher angle light rays (called high order modes) faster than the lower index glass near the center of the core. The index profile of the core of multimode GI fiber is not continuous, which is hard if not impossible to manufacture, but is in steps, from hundreds of steps to thousands depending on the fiber. As a mode of light goes through each step, it is bent slightly until it is reflected back toward the core of the fiber. 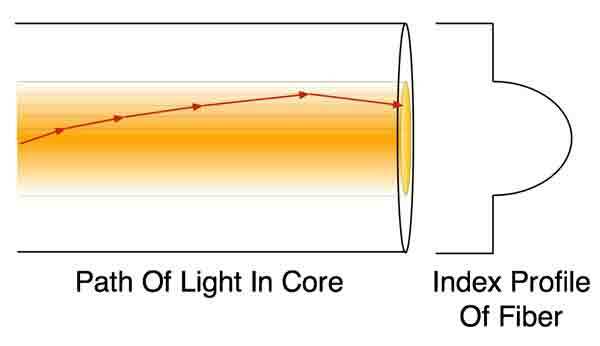 Since the light is going into lower index material in the outside of the core, it speeds up compared to the speed at the center of the core. 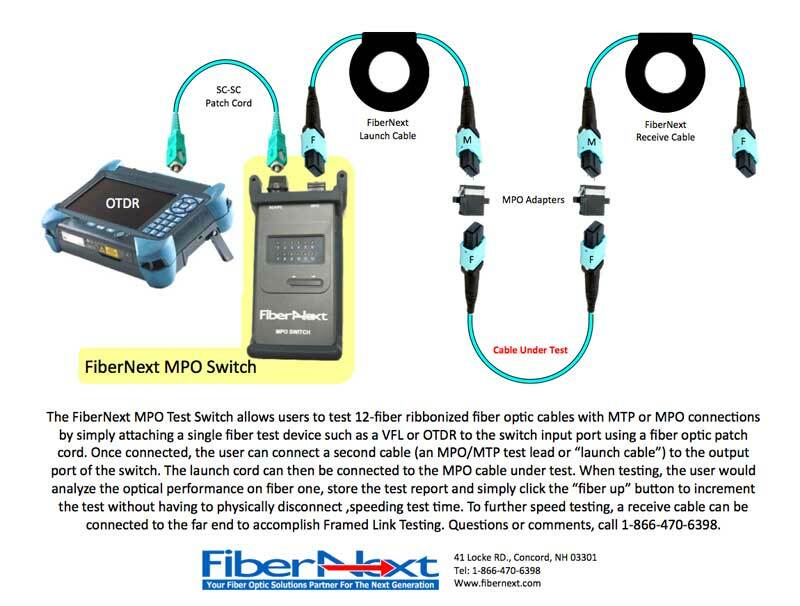 By carefully designing and manufacturing the fiber, you can get the average speed of a higher-order mode approximately the same as the modes going straight down the fiber, reducing modal dispersion.